Though we typically focus on game and entertainment news here on BrainLazy, we are always interested in expanding our b0undaries. With PAX East right around the corner, we thought it might be nice to temper our flood of impending video game coverage with a review of a good old fashioned book. To that end, we’d like to share the thoughts of a guest reviewer, a recent recruit to the BrainLazy staff. 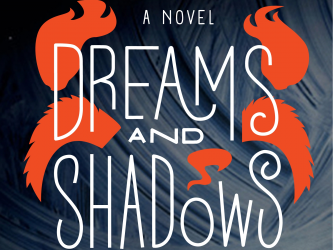 Below is her review of Dreams and Shadows, by C. Robert Cargill. Dreams and Shadows was a novel well worth the read. Every character and scene was wonderfully brought to life so perfectly, I felt I was watching the story rather than reading. Although in the beginning it felt a bit slow, before long I was enthralled. I totally loved the “Once upon a time…” opening. An adolescent love story unfolds; met in high school, love growing as did they, married later and at last Jared and Tiffany Thatcher have a beautiful boy Ewan. There their dream ends. We continue with another story; another family, this one broken, and another young boy. He is smart, playful, adventurous, and fearless in his imagination. A chance meeting, a decision must be made, and it is made. Without hesitation a hand is out, and I… I mean when Colby agrees to take Yashar’s hand. Yashar, a djinn or genie tantalizing our youth with the supernatural, sets the tone for Colby. And what a journey you are in for! The lessons are many, so pay attention. Ewan, he must be saved first. Colby must then be educated for this particular power he conned out of Yashar. That’s book 1, there’s more. These were boys, unsure. Now the trip spans years, shows the strengths there are in the magic of childhood, and friends. A boy’s wishes send him around the world to glimpse creatures both real and fantastic, telling of both failures and success. Adventure that produces unexpected friends and enemies such as Yashar, Coyote, Ewan, Mallaidh, Knocks, fairies, fallen angels, trolls, goblins, and more monsters than you can consider. C. Robert Cargill knows how to string the reader close, and now on to book two. The boys grow up and stay friends even as Colby traveled. One day fate found them, or was it Coyote, and of course in Austin. They are only a short ways by fairy distance to the Limestone Kingdom, the fairy court. Each boy reached his early 20’s. Colby is questioned from all, even himself. He’s still doing the right thing, isn’t he? He is only trying to keep his friend. Colby is questioned over his youthful, impulsive response. Many still think it ill-conceived, was that or Knocks the basis for even more attention. This along with secrets and tales of his travels keep all at a distance. There are battles that will change your perceptions radically. Goats, they ride goats from hell, I love it. The hunt for souls was fantastic and just different enough in both books to surprise. All of us have heard stories of fairies that lift only one of the earrings you left out, or the troll that took off with one fat sheep at the edge of the woods. Here, we learn more and also understand the need for the nightlight. According to Ewan, they work. Wizard magic, Yashar and shadows. Maybe they find more adventures. Let’s hope!